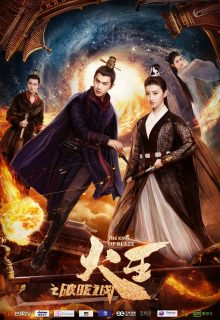 Chinese drama “the King of Blaze” tells the story of the Fire God Zhong Tian and the Wind God Qian Mei, who risk their lives to save their homeland, and their impossible love. Thousands of years ago there was a beautiful planet where the deities lived. Among them were six powerful gods inclduing the God of Fire, God of Wind who maintained peace in the planet. During a brutal battle with the dark forces, they were dealt a crushing blow. Qian Mei, the Wind God, disappears after the rescuing Zhong Tian, ​​the Fire God. To find an alternative energy source to save their planet, Zhong Tian travels to the Tang Dynasty. There he meets a soothsayer Feng Jian, who looks exactly like his long-lost love Qian Mei. Who is she and will Wind fulfill his mission of saving his homeland? episode 3 download has no sub. .
First of all if you are thinking of watching this drama, you definitly should. I started watching this just for the genre and there was nothing worthwhile for me. At first, it was okay. There was Gods and then historical theme, fights, cool powers, so I kept on then the season one ends and wham! The season two is there with a wirlwind. The main actor has gone and done a 180. It came from mediocre to superb. Since I think spoilers do spoil the drama for the next one watching this I would say, be patient, and give it a go, you won’t be dissapointed. Enjoy! Just waiting for tong feng to quickly recover her memories. Di yun already activated his plans.